It is a long-standing tradition to discuss the various alloying elements in terms of the properties they confer on steel. 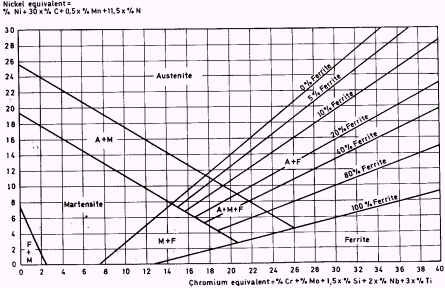 For example, the rule was that Chromium (Cr) makes steel hard whereas Nickel (Ni) and Manganese (Mn) make it tough. In saying this, one had certain types of steel in mind and transferred the properties of particular steel to the alloying element that was thought to have the greatest influence on the steel under consideration. This method of reasoning can give false impressions and the following examples will illustrate this point. When we say that Cr makes steel hard and wear-resisting we probably associate this with the 2% C, 12% Cr tool steel grade, which on hardening does in fact become very hard and hard-wearing. But if, on the other hand, we choose a steel containing 0,10% C and 12% Cr, the hardness obtained on hardening is very modest. It is quite true that Mn increases steel toughness if we have in mind the 13% manganese steel, so-called Hadfield steel. In concentrations between l% and 5%, however, Mn can produce a variable effect on the properties of the steel it is alloyed with. The toughness may either increase or decrease. A property of great importance is the ability of alloying elements to promote the formation of a certain phase or to stabilize it. 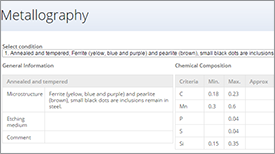 These elements are grouped as austenite-forming, ferrite-forming, carbide-forming and nitride-forming elements. The elements C, Ni and Mn are the most important ones in this group. Sufficiently large amounts of Ni or Mn render a steel austenitic even at room temperature. 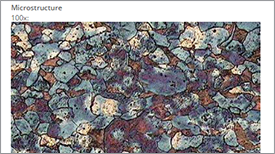 An example of this is the so-called Hadfield steel which contains 13% Mn, 1,2% Cr and l% C. In this steel both the Mn and C take part in stabilizing the austenite. Another example is austenitic stainless steel containing 18% Cr and 8% Ni. 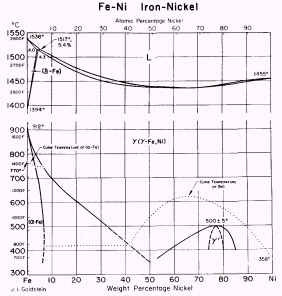 The equilibrium diagram for iron-nickel, Figure 1, shows how the range of stability of austenite increases with increasing Ni-content. 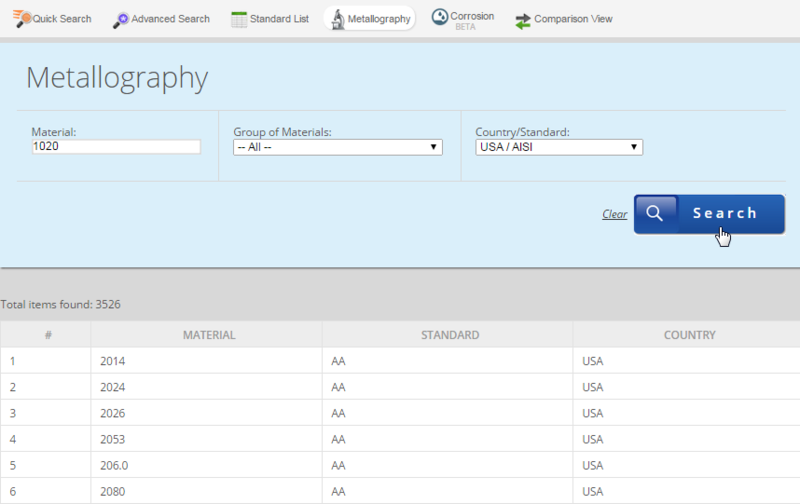 An alloy containing 10% Ni becomes wholly austenitic if heated to 700°C. On cooling, transformation from g to a takes place in the temperature range 700-300°C. The most important elements in this group are Cr, Si, Mo, W and Al. 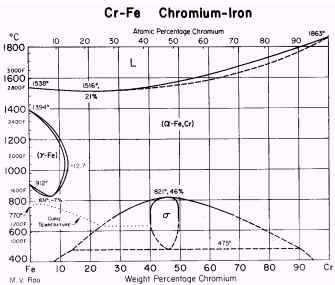 The range of stability of ferrite in iron-chromium alloys is shown in Figure 2. Fe-Cr alloys in the solid state containing more than 13% Cr are ferritic at all temperatures up to incipient melting. Another instance of ferritic steel is one that is used as transformer sheet material. This is a low-carbon steel containing about 3% Si. The great majority of steels contain at least three components. The constitution of such steels can be deduced from ternary phase diagrams (3 components). The interpretation of these diagrams is relatively difficult and they are of limited value to people dealing with practical heat treatment since they represent equilibrium conditions only. Furthermore, since most alloys contain more than three components it is necessary to look for other ways of assessing the effect produced by the alloying elements on the structural transformations occurring during heat treatment. One approach that is quite good is the use of Schaeffler diagrams (see Figure 3). Here the austenite formers are set out along the ordinate and the ferrite formers along the abscissa. The original diagram contained only Ni and Cr but the modified diagram includes other elements and gives them coefficients that reduce them to the equivalents of Ni or Cr respectively. The diagram holds good for the rates of cooling which result from welding. A 12% Cr steel containing 0,3% C is martensitic, the 0,3% C gives the steel a nickel equivalent of 9. 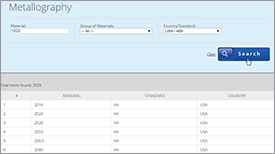 An 18/8 steel (18% Cr, 8% Ni) is austenitic if it contains 0-0,5% C and 2% Mn. The Ni content of such steels is usually kept between 9% and 10%. 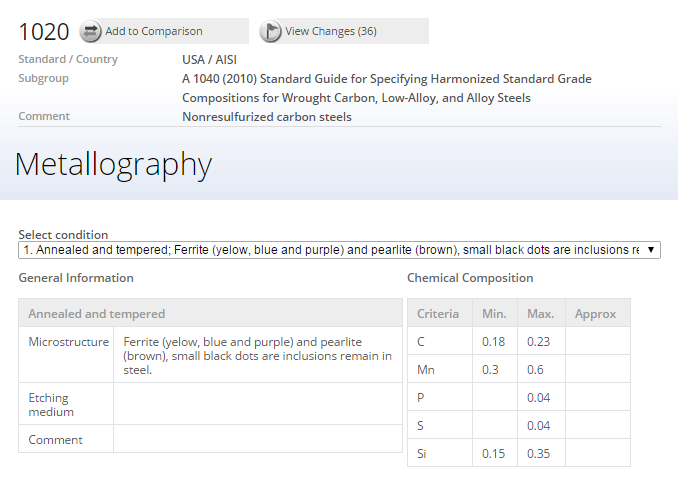 Hadfield steel with 13% Mn (mentioned above) is austenitic due to its high carbon content. 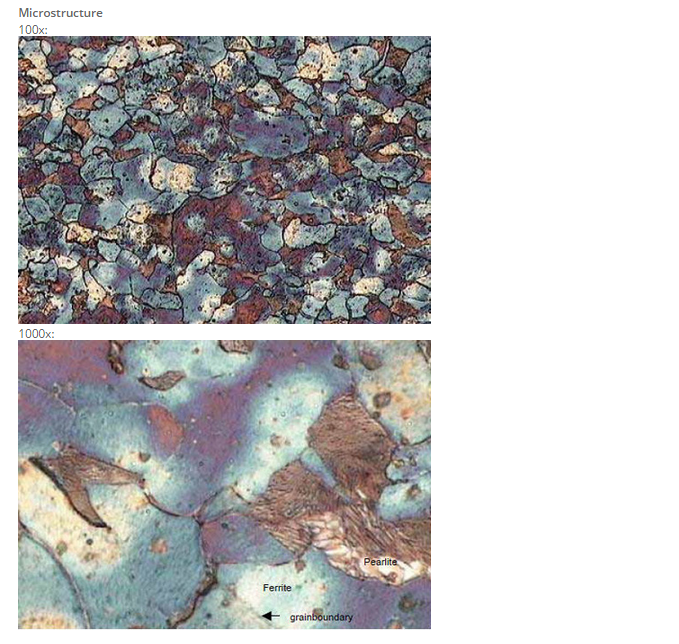 Should this be reduced to about 0,20% the steel becomes martensitic. Several ferrite formers also function as carbide formers. The majority of carbide formers are also ferrite formers with respect to Fe. The affinity of the elements in the line below for carbon increases from left to right. Cr, W, Mo, V, Ti, Nb, Ta, Zr. Some carbides may be referred to as special carbides, i.e. non-iron-containing carbides, such as Cr7C3 W2C, VC, Mo2C. Double or complex carbides contain both Fe and a carbide-forming element, for example Fe4W2C. High-speed and hot-work tool steels normally contain three types of carbides, which are usually designated M6C, M23C6 and MC. The letter M represents collectively all the metal atoms. Thus M6C represents Fe4W2C or Fe4Mo2C; M23C6 represents Cr23C6 and MC represents VC or V4C3. Note that Mn, which by itself is a very weak carbide former, is a relatively potent carbide stabilizer. In practice, Cr is the alloying element most commonly used as a carbide stabilizer. Malleable cast iron (i.e. white cast iron that is rendered soft by a graphitizing heat treatment called malleablizing) must not contain any Cr. Steel containing only Si or Ni is susceptible to graphitization, but this is most simply prevented by alloying with Cr. All carbide formers are also nitride formers. Nitrogen may be introduced into the surface of the steel by nitriding. 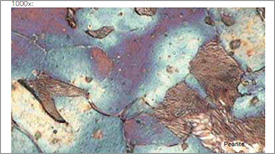 By measuring the hardness of various nitrided alloy steels it is possible to investigate the tendency of the different alloying elements to form hard nitrides or to increase the hardness of the steel by a mechanism known as precipitation hardening. 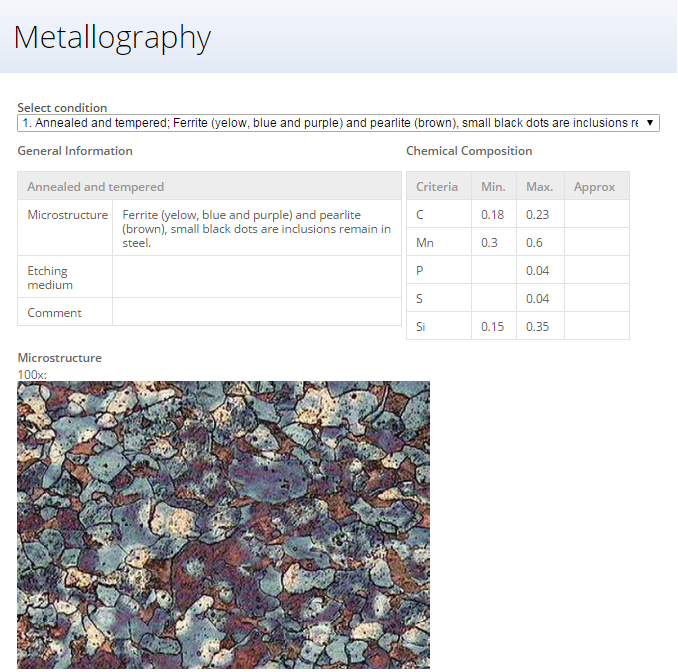 The results obtained by such investigations are shown in Figure 4, from which it can be seen that very high hardnesses result from alloying a steel with Al or Ti in amounts of about 1,5%. 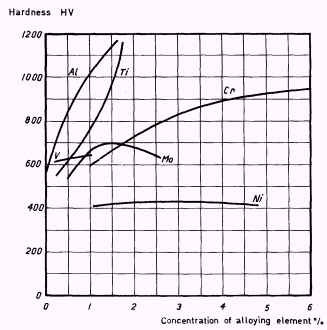 On nitriding the base material in Figure 4, hardness of about 400 HV is obtained and according to the diagram the hardness is unchanged if the steel is alloyed with Ni since this element is not a nitride former and hence does not contribute to any hardness increase.